How can a girl make friends at her new school? If young British teen Olivia can go on the class trip to New York, her social life can finally get started. The white girl’s No. 1 obstacle: lack of money. She starts a vlog to bring in the funds; surely, the ad revenue will pay for her airfare. Unfortunately, her initial attempts fail miserably. The solution: enlist shiny-haired aspiring actress Emma to be “Destiny,” fashionable vlogger extraordinaire, the girl every girl wants to be friends with. Bring on the fandom and the profits! It’s not long before the Destiny Channel goes viral, but how long before someone discovers it’s all fake? It’s not surprising when a classmate outs her, but considering Destiny’s immense fame, it’s puzzling that none of their schoolmates see the vlog and recognize popular, white Emma sooner. Guilt over dubious product placements adds an ethical dilemma to the silly story, as Olivia struggles to balance her need for cash with her morals. Is the trip worth endangering her viewers’ health? Olivia narrates the story through diary entries and vlog transcripts, complete with British colloquialisms. 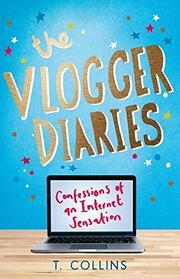 The book’s highlights are the vlog’s guffaw-inducing trolls. There’s the sarcastic “Evil Liam 13” and several members of the grammar police: “Pedantic Penguin,” “Ant the Pedant,” and “Grammar Leopard.” Whiteness is assumed throughout.